of the basic requirements for your class as required by NHRA or IHRA. Got a Tech inspection or racecar safety question? Fill in the form at left or EMAIL us. Information and diagrams are sourced from the IHRA Rulebook. 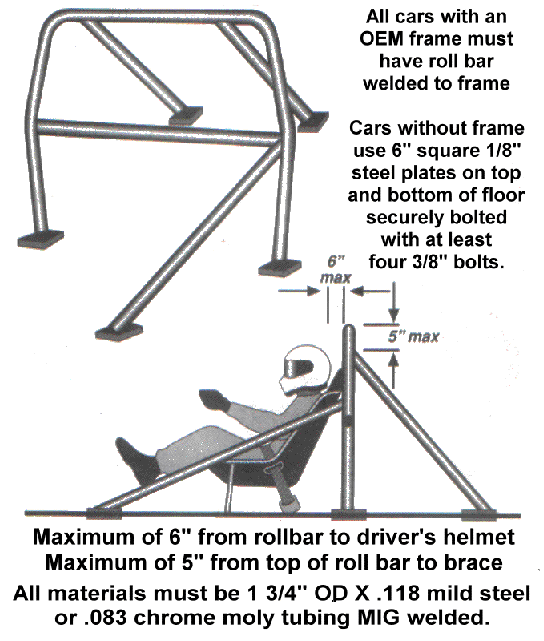 QUESTION: From our mailbox - Is a rollbar and a rollcage the same thing or is a rollbar just the hoop behind the driver? only becomes a cage with the addition of the windshield and dash bars - see illustration below - for more info check the bar / cage rules lower on this page. QUESTION: From our mailbox - I plan to put a 4 speed in my Street Class race car. Do I need a scattershield to pass tech? ANSWER: Not for your class. Rulebook says: 11.49 & quicker - SFI 6.1 Flywheel shield and SFI 1.1 clutch, pressure plate and flywheel are mandatory. QUESTION: From our mailbox - I have slicks on my car but it only goes 15 seconds for an ET. Do I need to have a driveshaft loop? What are the rules? ANSWER: No Matter what the ET a loop is required if your car has slicks. of the front U-joint. Any 9.99 sec car must have a second loop at the rear. No Matter what the ET a loop is required if your car has slicks. and how is it attached to the car? and have added the illustration below from the rulebook. bolts to framerails) must have roll bar welded or bolted to frame. must be free of slag and porosity. Any grinding of welds prohibited. have minimum 1/4-inch compression or meet SFI Spec 45.1.
firewall, floor faster than 11.49 must have rollcage and window net. the driver's helmet may contact it while in the driving position. x .058 MS or CM rectangular. between the shoulder and elbow. QUESTION: George H asked: What are the rules on wheel studs? far? Is there anything special that has to be done to the car before I put it on the track? Am I allowed to remove any of the interior for weight reduction? trunk if a battery or fuel cell is located there. If the stock drivers seat and belts and mounts are not modified in any way you are OK as well. plumbing? Where do I run my lines? How do I mount my gas tank? ANSWER: That's a lot of questions. Here we go with another reprint. braided line, may be mounted on firewall. of minimum 1 1/4-inch O.D. x .065 chrome moly or .118 mild-steel tubing. rear. 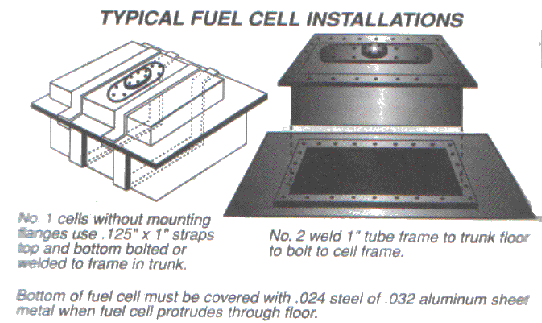 Non-metallic fuel cells or tanks must be grounded to frame. Question: John R. asked: Can I race my car without a hood? from being siphoned into the airstream or blown into driver's face. to help them get a little more traction. Is this legal? unless otherwise stated under Class Requirements, is 300pounds. price from most chassis manufacturers so cost is not a concern. OR FIREWALL - A FULL CAGE IS REQUIRED WITH WINDOW NET. welded shut.) Metal battery hold-down straps mandatory. boxes / trays with OEM hold downs permitted only in stock location. transmission shield meeting SFI spec 4.1 and labeled accordingly. transmission pan must be labeled as meeting SFI spec 4.1. Permitted in all classes where an automatic transmission is used. require ALL cars to have one - so be prepared. attached; no tie wraps, duct tape, etc. order with four-wheel hydraulic brakes as a minimum requirement. must be self-returning to normal brake operating mode. C.B.D.R.A. Tech Inspectors use the IHRA rule book. a whole winter building a car and then failing TECH at the first race. been inspected under the Extended Technical Inspection program. has been compliance with all applicable IHRA rules.